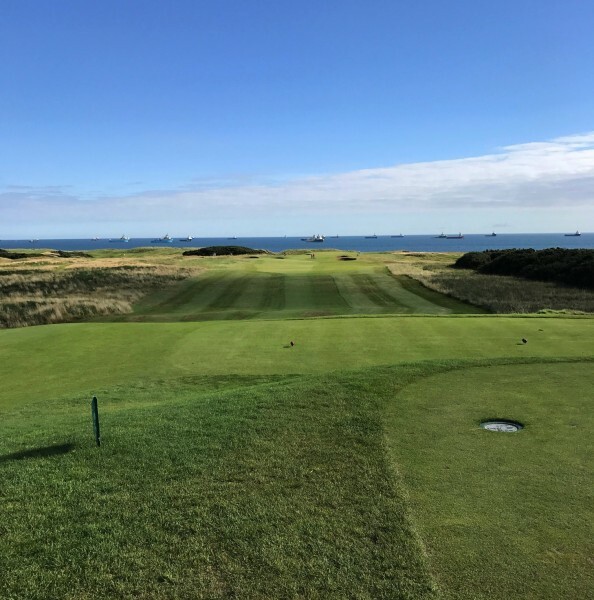 #32: Sun and Fun at Royal Aberdeen! You are here: Home › Blog › #32: Sun and Fun at Royal Aberdeen! #32: An Amazing Day at Royal Aberdeen! It was an unexpected treat to be invited to play at Royal Aberdeen Golf Club - and one that I could not refuse. I have visited Royal Aberdeen many times, but normally the rain is not far off and the clouds are gathering. Today was just the most amazing day: a perfect autumnal morning clear, crisp, and sunny with a fresh breeze blowing in off the North Sea. The view from the first tee at Royal Aberdeen Golf Club, as you can see, is breathtaking. Royal Aberdeen is recognised as the 6th Oldest golf club in the world. It moved to its current location in the second half of the 19th century, but what a links it has! It is one of Scotland’s most challenging courses and has hosted many tournaments over the years. In 2014 the Scottish Open Championship was held here, won by Justin Rose. As the current Olympic Gold Medalist in Golf, I think Royal Aberdeen must have helped him win that prize too. 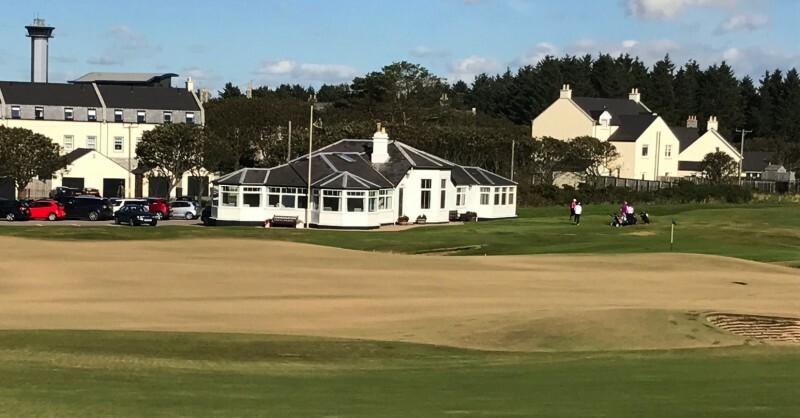 Te Balgownie Links offers a stern challenge following the traditional links layout of 9 out along the sea before turning back home on the back 9. The first hole runs perpendicular to the ocean, offering stunning views. It was such a glorious day, it was impossible not to have spirits soaring as I followed my white ball around the fairways. The views just kept getting better and better! My camera does not do it justice as this course nestles itself among the dunes and seems to almost disappear. Royal Aberdeen’s signature hole is the 8th hole. It is a tough par 3 with no less than 10 bunkers! I found many bunkers during the round, but I somehow managed to avoid them all on the 8th. 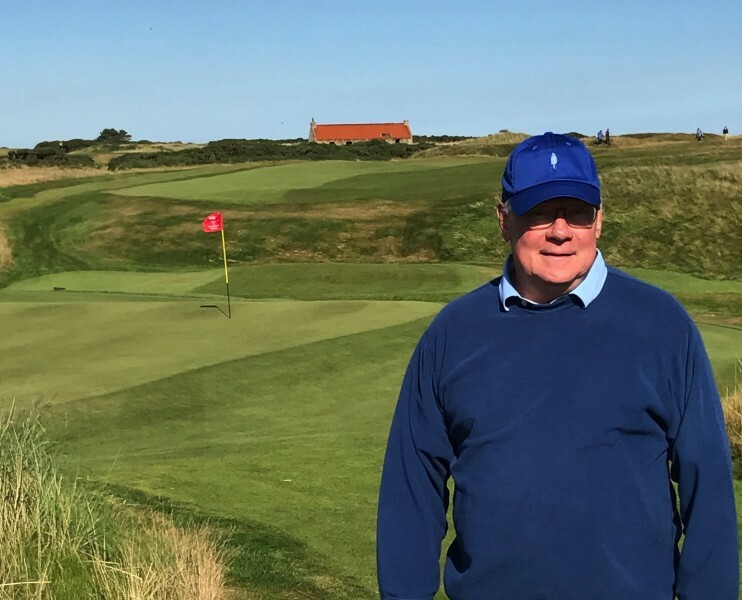 I am told none of the bunkers have names (unlike many of the courses in Scotland) but I felt I could have christened a few of them…. The fairways are tight at Royal Aberdeen and the wind blows steady off the sea, so there is plenty of challenge to find. 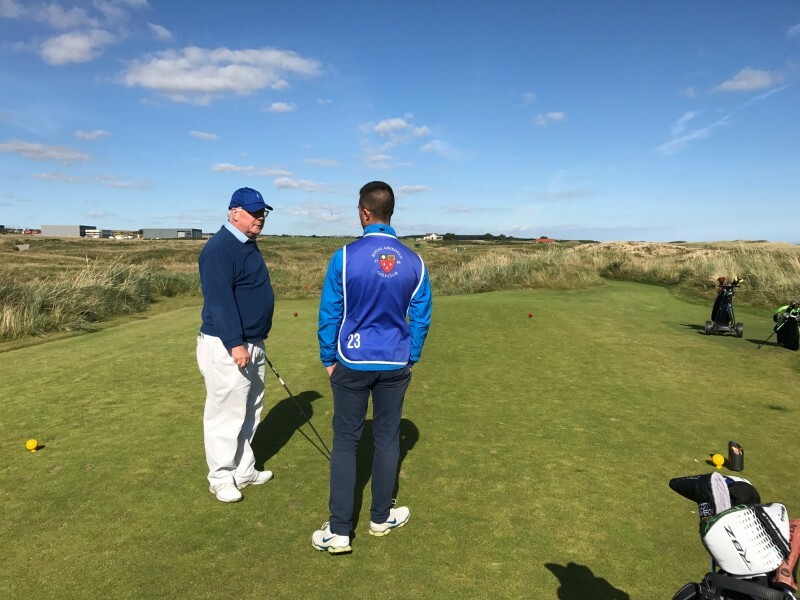 The pro told me that the ‘5 minute rule’ began at Royal Aberdeen Golf Club and it was later adopted by the RNA into the official rules of golf. I suspect it was with due cause that it started here. Murcar Links sits just north of Royal Aberdeen - one can see it just past the red roof building from the far end of the course. And apparently there is some rivalry between the two clubs. There is a wind turbine next to the 14th hole on Royal Aberdeen which powers an entire estate next to the course. 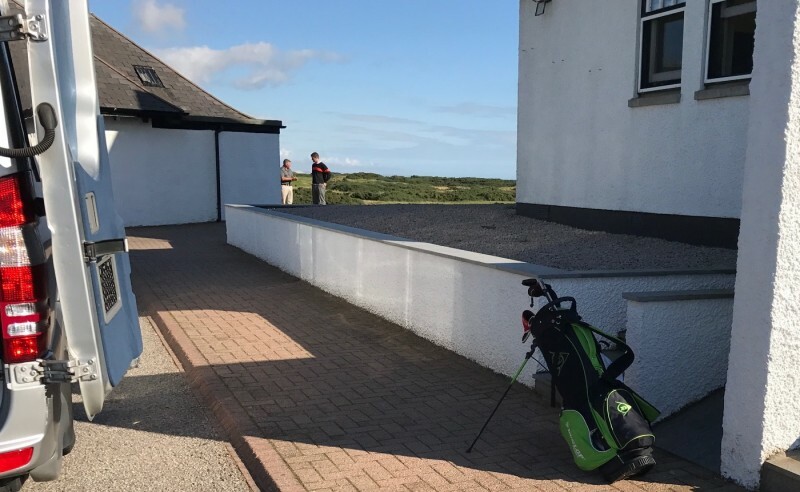 According to the caddie, Murcar was consulted when it was going in as they were the closest ‘official point’ to the installation - not Royal Aberdeen Golf Club! As it was going in adjacent to their rivals links, they did not object .... Fancy that! It seemed to pay off .... This is one ‘happy Joe’ walking off the 11th with a birdie! Having a good caddie was definitely a bonus here at Royal Aberdeen! As you come up the 18th at Royal Aberdeen you can see the Ladies Clubhouse. They officially have their own club, The Aberdeen Ladies Club, with full playing privileges on the course. Royal Aberdeen also has an ‘Executive Course’ we were told. Its longest hole is 320 yards, and our caddie told us it was ‘good fun’ which I took to mean that he could drive most of the greens! It must be an added bonus to have a second course during the busy summer months. We finished the round as we began with spirits high in glorious sunshine. It was just the most wonderful way to spend a day! Rumor has it he had a tap in par to win the match…bodes well for the Americans in the upcoming Ryder Cup! And my clubs and I were pleased at the finish … ready to head for home. My bag was a bit lighter after the round having left a few golf balls in the rough. But it was just another round of ‘happy golf’ on the links!